Overall, this was a good season for the Seahawks. Russell Wilson gets an A, as do Tyler Lockett, Doug Baldwin and Bobby Wagner. But there's lots of debate elsewhere. As we close the book on the Seahawks’ 43rd season, it’s time to open our grade book one last time. The season was a success by any measure, with a 10-6 record and a playoff spot, though the ending undoubtedly left a little to be desired. The real legacy of this season may be in what happens next. 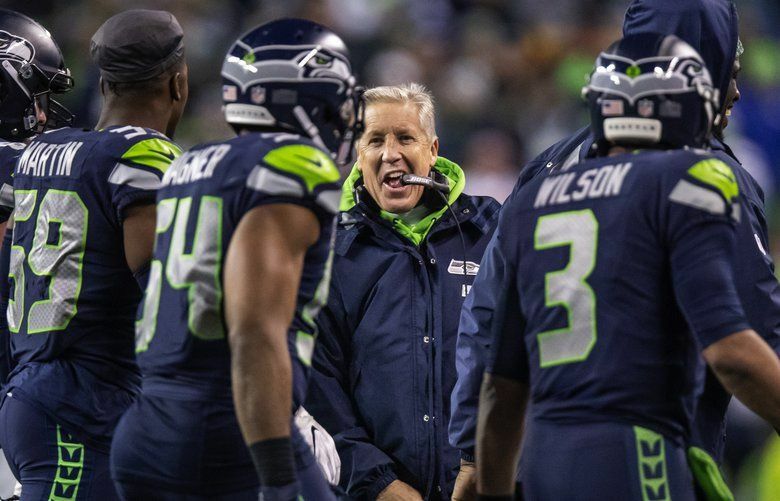 If this was truly a jumping off point to a successful second act of the Pete Carroll era — as Carroll and many others around the team think it is — then what happened this season may grow even more fonder in memory as time goes on (like, maybe, the 2012 season has). If not, then the missed opportunity at the end may sting that much more. 2018 Awards | Who is our MVP? Biggest disappointment? Breakout player? Hawks fire four strength & conditioning coaches, including longtime Carroll asst. But that’s a story for another year. Now, on to some season-ending grades for this one. The big controversy coming out of the playoff loss is that the Seahawks didn’t use Russell Wilson enough and tried too hard to rely on a rushing attack that ranked No. 1 in the NFL during the season. That itself speaks to the kind of season Wilson had. Wilson was historically efficient, setting a career high with 35 touchdown passes and tying a career-low with seven interceptions. And he did that despite seeing his leading receiver, Doug Baldwin, battle injuries all year, losing emerging rookie tight end Will Dissly early and seeing the Brandon Marshall experiment flop miserably. Some might question whether Wilson should have run more, especially to make the zone read more viable — his 67 rushing attempts were a career low. But at age 30, and given his value to the team, some caution is understandable. He was the only QB in the NFL to play every one of his team’s snaps. Chris Carson had the first 1,000-yard season for the Seahawks since 2014 and stamped himself as a legitimate NFL threat in his second year, while Mike Davis (4.6) and Rashaad Penny (4.9) also had solid per-carry averages. Penny was sporadic, to be sure. But his training-camp injury and rookie status played into that. Seattle will hope for a bit more consistency in 2018. But overall, this was a good group. Fullback Tre Madden played just 86 snaps, and the Seahawks could look for an upgrade. Tyler Lockett gets an ‘A,’ as does Doug Baldwin for his perseverance during a season he called “hell.’’ Everybody else gets a ‘C.’ Lockett was fantastic in leading the Seahawks with 57 catches for 965 yards and 10 TDs. Baldwin was gutty, and when healthy, still one of the best receivers in the NFL. But the playoff loss to Dallas — when the Cowboys effectively used a lot of man coverage — showed the need for the Seahawks to get more out of the rest of the crew. Jaron Brown had five touchdown catches but just 14 receptions, and David Moore — after appearing to emerge as a consistent threat at midseason — had just four catches for 32 yards in the last five games, and none in the playoffs. A position to watch in the offseason. What might have been had Dissly stayed healthy? Dissly’s 66-yard catch against Denver in the opener turned out to be the longest of the season for the Seahawks. Nick Vannett was solid, if not spectacular, and Ed Dickson had a knack for big plays. And maybe we should include George Fant in this group for all the times he lined up as a tight end. If Dissly comes back healthy and Dickson can enter the season healthy, this could be a group to make a lot more impact in 2019. 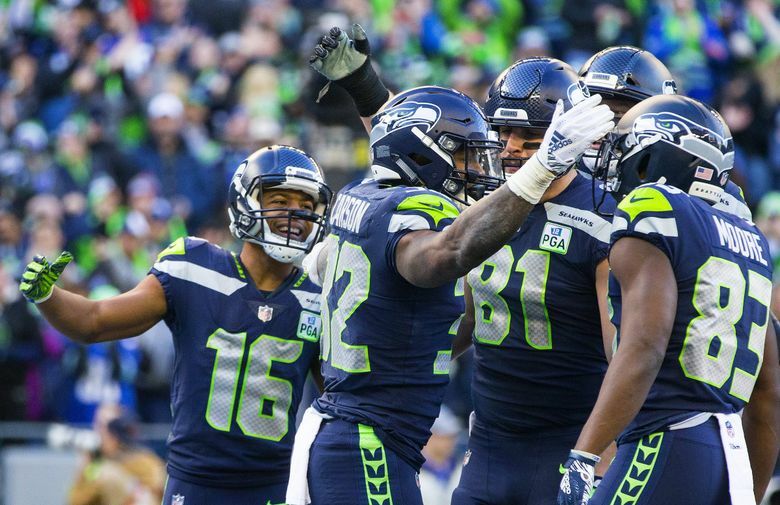 This might have been the most-improved position on the team, with the Seahawks reviving their running game to the tune of 160 yards a game — third-best in franchise history. Worth noting is that the Seahawks allowed 51 sacks — most in the Wilson era (granted, Wilson shares the blame). New line coach Mike Solari deserves a ton of credit. But with the addition of Duane Brown for an entire season at left tackle and the signings of D.J. Fluker and J.R. Sweezy to solidify the guard spots, this was the most experienced and proven offensive line Seattle has put out there since 2014. Germain Ifedi also had his best year at right tackle. The Seahawks will be left with some “what-might-have-been thoughts’’ thanks to Sweezy’s and Fluker’s injuries at the end. Here’s another spot where maybe we need some individual grades — ‘A’s’ for Frank Clark and Jarran Reed, ‘B’s’ for some young players who showed flashes such as Jacob Martin and Poona Ford, and maybe a ‘C-plus’ for the rest. Clark and Reed were one of the best end-tackle tandems in team history with 24.5 sacks, Ford stamped himself as a potential future starter at tackle and Martin showed a lot of playmaking ability. But Seattle needed more out of some of the other ends, especially Dion Jordan, who simply struggled to stay consistently healthy. The 4.9 yards allowed per rush speaks to some issues the line had defending the run. Bobby Wagner was an ‘A’ bordering on an ‘A-plus.’ K.J. Wright and the weakside linebacker group (Austin Calitro, Mychal Kendricks, Shaquem Griffin) mostly earn an incomplete as no one started more than five games. Barkevious Mingo was solid but didn’t make as many plays as would have been hoped, especially down the stretch. The growing assumption is that Wright won’t be back. Depending on Kendricks’ sentencing, he could be the replacement. If not, this will be an area the Seahawks will need to address in the offseason. Given the questions — how would the Seahawks respond without Richard Sherman, Kam Chancellor, and from the fourth game of the season on, Earl Thomas? — this group deserves more than a passing grade. Bradley McDougald proved one of the most valuable players on the team for holding the back end together in the wake of Thomas’ injury. Tre Flowers was a revelation at right cornerback. The team’s view of Shaquill Griffin’s first season at Sherman’s left corner spot is likely better than the public’s — those were big shoes to fill. And Tedric Thompson held his own. The Seahawks were 6-4 in the 10 games he started at free safety with three of the losses the close shaves against the Rams and Chargers. It does not quite measure up to the Legion of Boom. But there was enough good play for the team to be in a good position, overall. Michael Dickson gets an ‘A’ and Sebastian Janikowski at least made the three kicks that really mattered. But the rest was a little too erratic by the Seahawks’ usual standards, especially down the stretch when they lost one game (at San Francisco) and almost another (Arizona) almost solely due to special teams. The Seahawks need to clean things up in coverage and protection, and they likely need to find a new kicker, as well.